Arjun Kapoor's recent release 'Half Girlfriend' with Shraddha Kapoor continues to give a tough competition to Irrfan Khan-Saba Qamar starrer 'Hindi Medium' at the box office. Arjun Kapoor's recent release 'Half Girlfriend' with Shraddha Kapoor continues to give a tough competition to Irrfan Khan-Saba Qamar starrer 'Hindi Medium' at the box office. Both the movies witnessed a 'classy' clash on May 19, given that both the movies has been taking a dig at English language indirectly. A Mohit Suri directorial 'Half Girlfriend', which is based on Chetan Bhagat's novel of the same name, witnessed a decent start on its day of release despite mixed reviews and continued to maintain its collection on the second day as well with an earning of Rs 10.63 cr. On the other hand, Irrfan Khan's 'Hindi Medium', which is a story of a Hindi-speaking man struggling to find an English medium school for his daughter, earned rave reviews from the critics but got a disappointing start. However, the movie has shown a significant growth on its second day with a growth of 51.25%. 'Hindi Medium' made a collection of Rs 7.06 cr on day two. Bollywood trade analyst Taran Adarsh took it to micro-blogging site Twitter to share the box office reports of both the movies. #HalfGirlfriend Fri 10.27 cr, Sat 10.63 cr. Total: ₹ 20.90 cr. India biz. #HindiMedium Fri 2.81 cr, Sat 4.25 cr. Total: ₹ 7.06 cr. India biz. Growth on Sat: 51.25%... EXCELLENT GROWTH! Interestingly, both the movies are indeed facing a tought time at the box office given that both 'Half Girlfriend' and 'Hindi Medium' are bound to compete with SS Rajamouli's last release 'Baahubali: The Conclusion' which had taken the box office with a storm. Starring Prabhas, Rana Daggubati, Anushka Shetty, Ramaya Krishnan and Sathyaraj in key roles, the movie has garnered a collection of Rs 1500 cr worldwide. 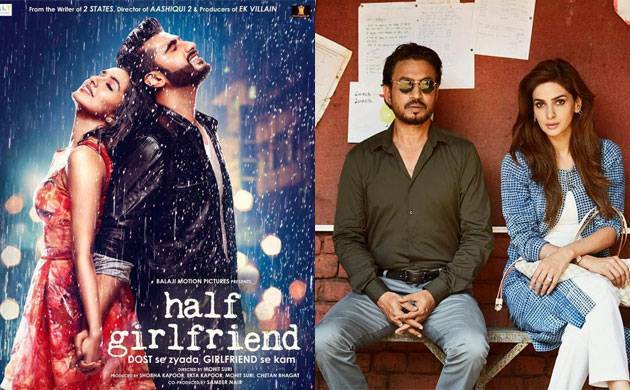 With such a hard competition, we wonder if Irrfan's 'Hindi Medium' and Arjun's 'Half Girlfriend' would be able to recover their respective cost of production.